"Fossil" gas, often called "natural gas" or simply "gas," is found in natural gas fields and also in association with oil fields and coal beds. "Biogas" is created by methanogenic microbes in marshes, bogs, landfills, sewage, the stomachs of ruminants such as cows, and sediments on the sea floor where in certain areas the gas combines with cold high-pressure water to form the ice-like methane clathrates. Natural gas from any source is a potent greenhouse gas if it is released to the atmosphere. Before fossil natural gas can be used as a fuel, it must undergo extensive processing to remove almost all materials other than methane. One of these materials is the valuable non-renewable gas helium. After it is cleaned of its impurities, fossil gas becomes a clean-burning and efficient source of heat used in a wide array of applications, including generation of electricity in central power plants, space heating for buildings ranging from homes to factories to offices, and process heating for uses ranging from residential food cooking and clothes drying to industrial glass melting, metal preheating, food processing, waste burning, and paper pulp drying. The cleaned natural gas also becomes a valuable source of methane building blocks (CH4) that can be readily converted to ammonia (NH4) for making fertilizer or methanol (CH3OH) for making industrial chemicals. Natural gas in the form of compressed natural gas (CNG) or liquified natural gas (LNG) is used as a major vehicle fuel in such countries as Argentina, Brazil, Pakistan, Italy, and India. In the US use of natural gas as a vehicle fuel is limited primarily to fleet vehicles like buses. The planned Iran-Pakistan-India pipeline, which would deliver Iranian natural gas to Pakistan and India, has been called the peace pipeline, as it would help build interdependence in that volatile region. The primary component of natural gas is methane (CH4), the shortest and lightest hydrocarbon molecule. Natural gas as a fossil fuel also contains heavier gaseous hydrocarbons such as ethane (C2H6), propane (C3H8) and butane (C4H10), as well as sulfur-containing gases in varying amounts. Fossil natural gas also contains in varying amounts and is the primary market source of helium, a non-renewable and valuable resource. Due primarily to factors of cost and expediency, only a small portion of the helium in natural gas is actually recovered from the gas. Most of the natural gas extracted from the earth is never treated to have the helium separated, so that helium eventually escapes to the atmosphere unused. Nitrogen, helium, carbon dioxide and trace amounts of hydrogen sulfide, water and odorants can also be present. Mercury is also present in small amounts in natural gas extracted from some fields. The exact composition of natural gas varies between gas fields. Organosulfur compounds and hydrogen sulfide are common contaminants that must be removed prior to most uses. Gas with a significant amount of sulfur impurities, such as hydrogen sulfide, is termed sour gas and often referred to as "acid gas.” Processed Natural gas that is available to end-users is tasteless and odorless, however, before gas is distributed to end-users, it is odorized by adding small amounts of thiols, to assist in leak detection. Processed Natural gas is, in itself, harmless to the human body—however, natural gas is a simple asphyxiant and can kill if it displaces air to the point where the oxygen content will not support life. Natural gas can also be hazardous to life and property through an explosion. Natural gas is lighter than air, and so tends to dissipate into the atmosphere. But when natural gas is confined, such as within a house, gas concentrations can reach explosive mixtures and, if ignited, result in blasts that could destroy buildings. Methane has a lower explosive limit of 5 percent in air, and an upper explosive limit of 15 percent. Explosive concerns with compressed natural gas used in vehicles are almost non-existent, due to the escaping nature of the gas, and the need to maintain concentrations between 5 percent and 15 percent to trigger explosions. Quantities of natural gas are measured in normal cubic meters (corresponding to 0 °C at 1 atm) or in standard cubic feet (corresponding to 60 °F and 30 inches mercury). The gross heat of combustion of one normal cubic meter of commercial quality natural gas is around 39 megajoules (≈10.8 kilowatt-hours), but this can vary by several percent. In U.S. units, one standard cubic foot of natural gas produces around 1,000 British Thermal Units (BTUs). The actual heating value when the water formed does not condense is the net heat of combustion and can be as much as 10 percent less. In the United States, natural gas is often sold at retail in units of therms (th), where 1 therm = 100,000 BTU. Wholesale transactions are generally done in decatherms (Dth), or thousand decatherms (MDth), or million decatherms (MMDth). A million decatherms is roughly a billion cubic feet of natural gas. Natural gas production around the world. Production is highest in areas in brown, followed by those in red. Natural gas as a fossil fuel is commercially produced from oil fields and natural gas fields. Gas produced from oil wells is called casinghead gas or associated gas. The largest two natural gas fields are probably South Pars Gas Field in Iran and Urengoy gas field in Russia, with reserves on the order of 1013 cubic meters. Qatar also has 25 trillion cubic meters of natural gas (5 percent of the world's proven supply), enough to last 250 years at current production levels. 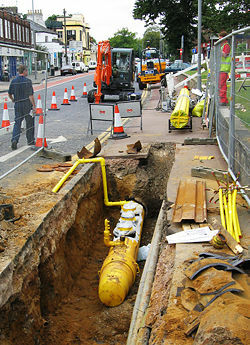 Town gas is a mixture of methane and other gases that can be used in a similar way to natural gas and can be produced by treating coal chemically. This is a historic technology, still used as 'best solution' in some local circumstances, although coal gasification is not usually economic at current gas prices, depending upon infrastructure considerations. Methanogenic archaea are responsible for all biological sources of methane, some in symbiotic relationships with other life forms, including termites, ruminants, and cultivated crops. Methane released directly into the atmosphere would be considered a pollutant, however, methane in the atmosphere is oxidized, producing carbon dioxide and water. Future sources of methane, the principal component of natural gas, include landfill gas, biogas and methane hydrate. Biogas, and especially landfill gas, is already used in some areas, but their use could be greatly expanded. Landfill gas is a type of biogas, but biogas usually refers to gas produced from organic material that has not been mixed with other waste. Landfill gas is created from the decomposition of waste in landfills. If the gas is not removed, the pressure may get so high that it works its way to the surface, causing damage to the landfill structure, unpleasant odor, vegetation die-off and an explosion hazard. The gas can be vented to the atmosphere, flared or burned to produce electricity or heat. Once water vapor is removed, about half of landfill gas is methane. Almost all of the rest is carbon dioxide, but there are also small amounts of nitrogen, oxygen and hydrogen. There are usually trace amounts of hydrogen sulfide and siloxanes, but their concentration varies widely. Landfill gas cannot be distributed through natural gas pipelines unless it is cleaned up to the same quality. It is usually more economical to combust the gas on site or within a short distance of the landfill using a dedicated pipeline. Water vapor is often removed, even if combusting the gas on site. Other non-methane components may also be removed in order to meet emissions standards, to prevent fouling of the equipment or for environmental considerations. Co-firing landfill gas with natural gas improves combustion, which lowers emissions. Biogas is usually produced using agricultural waste materials, such as unmerchantable parts of plants and manure. Biogas can also be produced by separating organic materials from waste that otherwise goes to landfills, which is more efficient than just capturing the landfill gas it produces. Using materials that would otherwise generate no income, or even cost money to get rid of, improves the profitability and energy balance of biogas production. Anaerobic lagoons are used to produce biogas from manure, while biogas reactors can be used for manure or plant parts. Like landfill gas, biogas is mostly methane and carbon dioxide, with small amounts of nitrogen, oxygen and hydrogen. However, with the exception of pesticides, there are usually lower levels of contaminants. A speculative source of enormous quantities of methane is from methane hydrate, found under sediments in the oceans. As of 2009 no technology has been developed to recover it economically, but significant progress is being made toward that end. The major difficulty in the use of natural gas is transportation and storage because of its low density. Natural gas pipelines are economical, but are impractical across oceans. Many existing pipelines in North America are close to reaching their capacity, prompting some politicians in colder climates to speak publicly of potential shortages. Tanker ships can be used to transport liquefied natural gas (LNG) across oceans, while tank trucks can carry liquefied or compressed natural gas (CNG) over shorter distances. They may transport natural gas directly to end-users, or to distribution points such as pipelines for further transport. These may have a higher cost, requiring additional facilities for liquefaction or compression at the production point, and then gasification or decompression at end-use facilities or into a pipeline. In the past, the natural gas which was recovered in the course of recovering petroleum could not be profitably sold, and was simply burned at the oil field (known as flaring). This wasteful practice is now illegal in many countries, especially since it adds greenhouse gas pollution to the earth's atmosphere. Additionally, companies now recognize that value for the gas may be achieved with LNG, CNG, or other transportation methods to end-users in the future. The gas is now re-injected back into the formation for later recovery. This also assists oil pumping by keeping underground pressures higher. In Saudi Arabia, in the late 1970s, a "Master Gas System" was created, ending the need for flaring. The natural gas is used to generate electricity and heat for desalinization. Similarly, some landfills that also discharge methane gases have been set up to capture the methane and generate electricity. Natural gas is often stored in underground caverns formed inside depleted gas reservoirs from previous gas wells, salt domes, or in tanks as liquefied natural gas. The gas is injected during periods of low demand and extracted during periods of higher demand. Storage near the ultimate end-users helps to best meet volatile demands, but this may not always be practicable. Natural gas is a major source for electricity generation through the use of gas and steam turbines. Particularly high efficiencies can be achieved through combining gas turbines with a steam turbine in combined cycle mode. Natural gas burns cleaner than other fossil fuels, such as oil and coal, and produces less greenhouse gas per unit energy released. For an equivalent amount of heat, burning natural gas produces about 30 percent less carbon dioxide than burning petroleum and about 45 percent less than burning coal. Combined cycle power generation using natural gas is thus the cleanest source of power available using fossil fuels, and this technology is widely used wherever gas can be obtained at a reasonable cost. Fuel cell technology may eventually provide cleaner options for converting natural gas into electricity, but as yet it is not price-competitive. Natural gas as a fossil fuel is, like oil, a non-renewable resource whose rate of consumption exceeds the rate of discovery of new sources. The US Energy Information Administration projects that world gas production will continue to increase at least through 2030. Natural gas can be used to produce hydrogen that can be used in hydrogen vehicles. Compressed natural gas (CNG) is used as a clean alternative to other automobile fuels such as gasoline (petrol) and diesel. As of 2005, the countries with the largest number of natural gas vehicles were Argentina, Brazil, Pakistan, Italy, and India. The energy efficiency CNG engines is generally equal to that of gasoline engines, but lower than that of modern diesel engines. Liquified petroleum gas (LPG), a blend of propane and butane, is also used to fuel vehicles. LPG and CNG vehicle fuel systems are not compatible. CNG also requires higher pressure tanks that are typically much heavier than those used for LPG. 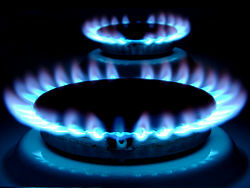 Natural gas is supplied to homes, where it is used for such purposes as cooking in natural gas-powered ranges and/or ovens, natural gas-heated clothes dryers, and heating/cooling. Home or other building heating may include boilers, furnaces, and water heaters. CNG is used in rural homes without connections to piped-in public utility services, or with portable grills. In any form, a minute amount of odorant such as t-butyl mercaptan, with a rotting-cabbage-like smell, is added to the otherwise colorless and odorless gas, so that leaks can be detected before a fire or explosion occurs. Sometimes a related compound, thiophane is used, with a rotten-egg smell. Adding odorant to natural gas began in the United States after the 1937 New London School explosion. The buildup of gas in the school went unnoticed, killing three hundred students and faculty when it ignited. Odorants are considered non-toxic in the extremely low concentrations occurring in natural gas delivered to the end user. In mines, where methane seeping from rock formations has no odor, sensors are used, and mining apparatus has been specifically developed to avoid ignition sources, e.g., the Davy lamp. Explosions caused by natural gas leaks occur a few times each year. Individual homes, small businesses and boats are most frequently affected when an internal leak builds up gas inside the structure. Frequently, the blast will be enough to significantly damage a building but leave it standing. In these cases, the people inside tend to have minor to moderate injuries. Occasionally, the gas can collect in high enough quantities to cause a deadly explosion, disintegrating one or more buildings in the process. The gas usually dissipates readily outdoors, but can sometimes collect in dangerous quantities if weather conditions are right. Also, considering the tens of millions of structures that use the fuel, the individual risk of using natural gas is very low. Some gas fields yield sour gas containing hydrogen sulfide (H2S). This untreated gas is toxic. Amine gas treating, an industrial scale process which removes acidic gaseous components, can be used to remove hydrogen sulfide from natural gas. Extraction of natural gas (or oil) leads to decrease in pressure in the reservoir. This in turn may lead to subsidence at ground level. Subsidence may affect ecosystems, waterways, sewer and water supply systems, foundations, and so on. Many politicians and prominent figures in North America have spoken publicly about a possible natural gas crisis. This includes former secretary of energy Spencer Abraham, former chairman of the Federal Reserve Alan Greenspan, and Ontario minister of energy Dwight Duncan. The natural gas crisis is typically described by the increasing price of natural gas in the U.S. over the last few years, due to the decline in indigenous supply and the increase in demand for electricity generation. Indigenous supply has fallen from 20,570,295 MMcf in 2001 to 19,144,768 MMcf in 2005. Because of the drop in production (exacerbated by the dramatic hit to production that came from Hurricanes Katrina and Rita) and the continuing growth in demand, the price has become so high that many industrial users, mainly in the petrochemical industry, have closed their plants causing loss of jobs. Greenspan has suggested that a solution to the natural gas crisis is the import of liquefied natural gas. This solution is both capital intensive and politically charged due to the public perception that LNG terminals are explosive risks, especially in the wake of the 9/11 terrorist attacks in the United States. The U.S. Department of Homeland Security is responsible for maintaining their security. New or expanded LNG terminals create tough infrastructure problems and require high capital spending. LNG terminals require a very spacious—at least 40 feet (12.2 meters) deep—harbor, as well as being sheltered from wind and waves. These "suitable" sites are thus deep in well-populated seaports, which are also burdened with right-of-way concerns for LNG pipelines, or conversely, required to also host the LNG expansion plant facilities and end use (petrochemical) plants amidst the high population densities of major cities, with the associated fumes, multiple serious risks to safety. Typically, to attain "well-sheltered" waters, suitable harbor sites are well up rivers or estuaries, which are unlikely to be dredged deep enough. Since these very large vessels must move slowly and ponderously in restricted waters, the transit times to and from the terminal become costly, as multiple tugboats and security boats shelter and safeguard the large vessels. Operationally, LNG tankers are (for example, in Boston) effectively given sole use of the harbor, forced to arrive and depart during non-peak hours, and precluded from occupying the same harbor until the first is well-departed. These factors increase operating costs and make capital investment less attractive. To substantially increase the amount of LNG used to supply natural gas to North America, not only must "re-gasification" plants be built on North American shores—difficult for the reasons stated above—someone also must put substantial, new liquefaction stations in Indonesia, the Middle East, and Africa, in order to concentrate the gas generally associated with oil production in those areas. A substantial expansion of the fleet of tanker ships also must occur, to move the huge amount of fuel needed to make up for the coming shortfall in Northeast America. ↑ WVU's AFVTP - Propane Review, West Virginia University. Retrieved March 9, 2009. ↑ Using Gas Geochemistry to Assess Mercury Risk, OilTracers, 2006. Retrieved March 9, 2009. ↑ National Energy Technology Laboratory Comparative Assessment of Advanced Gas Hydrate Production Methods, The National Methane Hydrates R&D Program. Retrieved February 28, 2009. ↑ Naturalgas.org - National Gas and the Environment. Retrieved March 9, 2009. ↑ US Energy Information Administration: Table 5. World natural gas production by region and country, 2005-2030 Retrieved February 28, 2009. ↑ International Association for Natural Gas Vehicles - Statistics. Retrieved March 9, 2009. ↑ U.S. Natural Gas Marketed Production 1900 - 2005 (MMcf) (in English). U.S. Department of Energy. Retrieved Sept. 11, 2006. This page was last modified on 13 November 2018, at 17:08.